You see funny people all the time and frankly it’s frustrating. Why are they so funny while you struggle? What is the key to being funnier? Something happened early on in your life and you didn’t even know it. On your path to growing up there was a fork in the road and you didn’t even see it. Don’t worry, its not your fault, no one sees it. That fork in the road was a subtle, subconscious decision to keep trying to be funny. To continue to get laughs. For some people, making others laugh was such a thrill they tried to do it every chance they got. Some of these people turned into the class clown and where willing to do anything to get a laugh (Hey look, noodles are coming out my nose). Others decided to travel more towards the class wit route and preferred to use words like a magician uses magic. And still others, faced with those obviously competing to be the funniest person, decided (again subconsciously) that trying to be funny wasn’t worth the risk; the reward just wasn’t there. To compensate and “feel better” self-talk reinforced the decision and made it seem the right thing to do. After all, I’m just not funny. Let me give you an example from Will Smith. 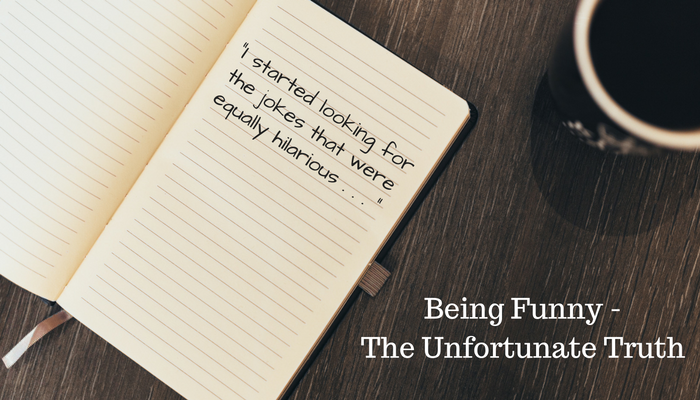 In a Reader’s Digest interview he shared how he worked to find jokes that worked with the black kids he hung out with and the white kids he went to school with. You aren’t enjoying the same success as funny people. But, you can Un-Arrest Your Humor Development and begin learning and practicing how to be funny.